Good navigation was paramount as well as overall speed, and as such many of the top riders lost valuable time after missing a waypoint. Using his experience, KTM 450 Rally mounted Sam Sunderland from the UK moved up through the order as the day went on. Riding consistently, Sunderland posted a fastest time of just over three hours and 20 minutes. 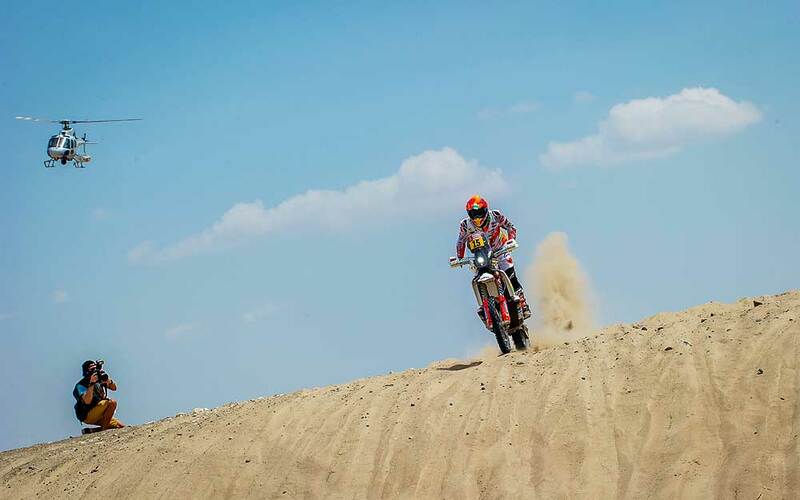 With today’s stage win, 2017 Dakar champion Sunderland also moves to the top of the overall standings, over four minutes ahead of the next placed rider. 2016 Dakar champion Toby Price was flying straight from the start of the timed special. The Australian placed second at the first waypoint, just nine seconds behind team-mate Sunderland. A crash three quarters of the way into the stage cost him a few minutes, but Price continued, eventually posting the third fastest time. Unfortunately, a five-minute penalty relegated Toby to 10th position at the end of the day. "Everything felt really good, I was really comfortable on the bike," the Australian said. "I knew my pace was good and so I kept on pushing. I did come off the bike after a big drop-off from one of the dunes around the 140km mark. Luckily, I didn’t damage myself or the bike too much, the road-book got filled with sand though so for the rest of the stage I had to just ease my pace a little. One of the worst things was that I lost the end to my camelback in the crash and wasn’t able to keep hydrated towards the finish. Apart from that everything was good, you can see on days like today how important it is to stay focused and not make any mistakes. Hopefully I can keep up the same performance for the rest of the rally." Continuing to find his form, Antoine Meo placed seventh at the end of the stage. The former enduro world champion made a slight error halfway through the day but luckily didn’t lose much time. "It’s been a mixed day for me today – half really good and half not so good," Meo reported. "I made a big mistake at the 83km point when after riding alone for the beginning of the stage, I caught a rider in front. Instead of staying to the line I tried to get past him by taking a small detour but it ended up costing me some time. Other than that, I am really pleased with my pace, and the bike is performing perfectly. I’ll try to make up some time Tuesday." After placing third on day two, Matthias Walker was one of the first bikes to enter the stage. 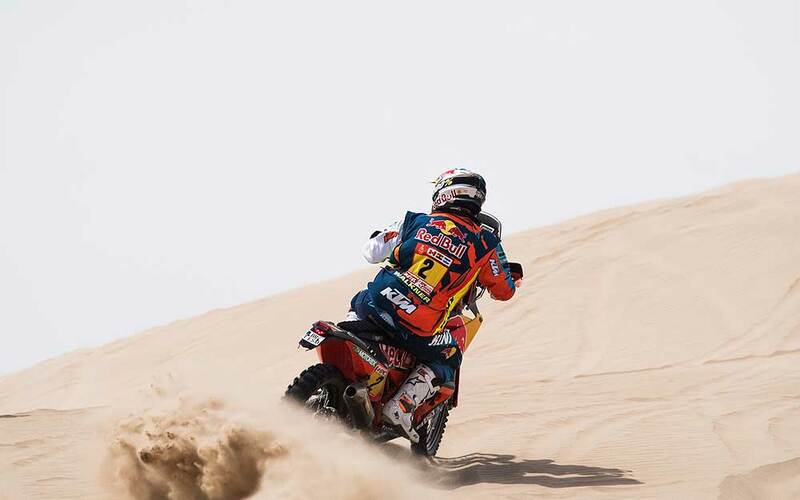 The Austrian had a tough day in the soft dunes and completed the day 12th overall, nine minutes down on his team-mate Sunderland. Although disappointed with the result, Walkner is still upbeat about the rest of the rally. "That was quite a rough day for me today," said Walkner. "I started off third but obviously dropped some places as the stage went on. Luckily, I haven’t actually lost too much time on the guys in front and some of the other riders fared a lot worse by making mistakes with their navigation. There are still 11 days to go so I’ll just keep on pushing and see where we are after that." 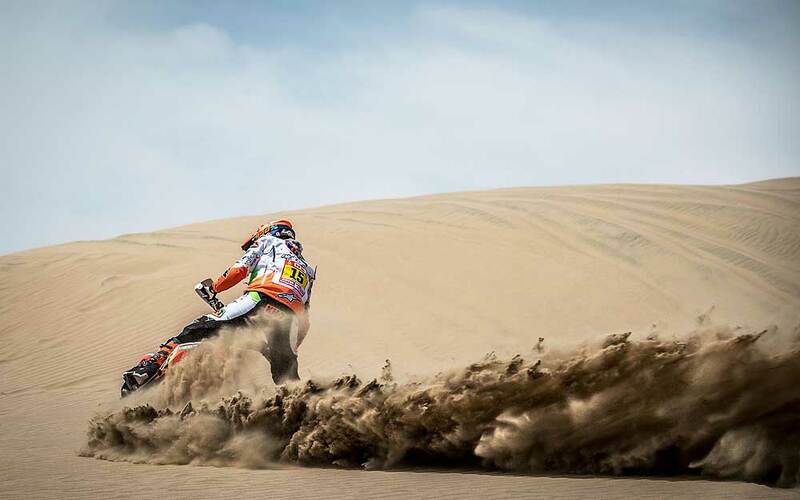 ‘Queen of the Desert’ Laia Sanz showed again why she is by far the leading female rider at the Dakar. The Spaniard put in a sensational performance throughout the day to finish in 15th overall. Navigating perfectly through the difficult stage Laia now sits 17th in the provisional overall standings. "That was a good stage, I felt confident and was able to push - the whole day went really well," Laia reported after the stage. "After the halfway point there was quite a lot of dust but I was able to navigate well and didn’t make any mistakes. It was a lot nicer to ride than Sunday’s stage too as we weren’t following the cars or crossing their tracks. I’m looking forward to Tuesday now and hope for another good day."